The hemagglutinin (HA) and neuraminidase (NA) glycoproteins of the influenza virus particle serve distinct functions during infection. The HA binds sialic acid-containing cellular receptors and mediates fusion of the viral and cell membranes, while the NA removes sialic acids from glycoproteins. Apparently this division of labor is not absolute: influenza viruses have been identified with NA molecules that serve as receptor binding proteins. An influenza virus was created that could not bind sialic acid by introducing multiple mutations into the HA gene. This mutant virus was not expected to be infectious, but nevertheless did propagate to moderate titers in cell culture. A single amino acid change was identified in the NA protein of this virus: G147R, which is just above the active site of the enzyme (illustrated; active site marked with green spheres). Passage of the virus in cell culture produced a virus that multiplied to higher titers; improved growth was caused by a K62E change in the HA stalk. 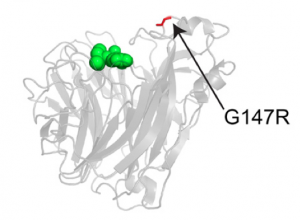 The results of site-directed mutagenesis showed that the G147R change allowed the NA protein to serve the receptor binding function normally provided by HA. It is not clear how the HA change leads to improved growth of the G147 virus. Although the G147R NA can serve as receptor binding protein, the HA is still required for fusion: abolishing this activity by mutation or by treatment with a fusion-blocking antibody did not allow virus growth. The influenza NA protein is an enzyme (sialidase) that cleaves sialic acids from cellular and viral proteins. The G147R NA is active as a sialidase, and this activity can be blocked by the antiviral compound oseltamivir, which is an NA inhibitor. Treatment of G147R-containing virus with oseltamivir also blocked virus binding to cells. Virus-like particles that contain G147R NA but not HA can attach to sialic acid-containing red blood cells. This attachment can be reversed by oseltamivir. After binding to red blood cells, these virus-like particles slowly fall off, a consequence of NA cleaving sialic acid receptors. These observations indicate that the G147R NA binds to sialic acids at the active site of the enzyme, and cleaves the same receptor that it binds. Treatment of cells with a bacterial sialidase that removes a broad range of sialic acids only partially inhibits G147R NA-mediated binding to cells. In contrast, growth of wild type influenza virus is completely blocked by this treatment. Therefore the receptor recognized by G147R NA is not the same as that bound by wild type virus. Changing the influenza virus NA to a receptor binding protein is not simply a laboratory curiosity: the G147R NA change was found in 31 of 19,528 NA protein sequences in the Influenza Virus Resource. They occur in seasonal H1N1 viruses that circulated before 2009, in the 2009 swine-origin pandemic H1N1 virus, and in avian H5N1 viruses. The presence of this change in phylogenetic clusters of seasonal H1N1 and chicken H5N1 sequences suggests that they are also found in circulating viruses, and are not simply sequence errors or the product of passage in the laboratory. These observations emphasize the remarkable flexibility of the influenza viral glycoproteins in their ability to switch receptor binding function from HA to NA. They might also have implications for vaccines, whose effectiveness are thought to depend largely on the induction of antibodies that block the function of HA protein. The work underscores the importance of serendipity in science: the HA receptor binding mutant virus was originally produced as a negative control for a different experiment. The glycans present on cells are complex and can prevent infection http://ruleof6ix.fieldofscience.com/2013/11/do-carbohydrates-play-role-in-intrinsic.html) and can promote infection (e.g. influenza). But we really have little understanding about what is present on our cells (http://www.ncbi.nlm.nih.gov/pubmed/23516363) and for influenza virus, entry isn’t as simple as alpha 2,3 versus alpha 2,6 (http://www.ncbi.nlm.nih.gov/pubmed/24074599). Conclusion: There is still so much to learn about what we thought was relatively simple! i was wondering that how does this defective virus complete “a single amino acid change ” in NA protein before it enters a cell. as virus doesn’t know whether its progeny can entry a new host after leaving current host cell. Could you explain it to me? Thank you.